North American travel card spending has continued its steady growth since 2012, posting spending gains in each of the past three years, elevating estimated annual travel card spending by corporations, governments, and not-for-profit organizations from $168 billion in 2012 to $192 billion at the close of 2015 (an annual average growth rate of about 4.8% per year). Going forward, we project annual travel card spending in the U.S. and Canada will rise to $197 billion by the end of 2016. By 2020, we estimate that total annual travel card spending in the U.S. and Canada will be about $221 billion. While the expected growth rates differ by market segment, the average annual growth rate of 3% over the next five years reflects modest slowdown in the pace of increase in travel card spending. A closer economic assessment of current card use patterns indicates that overall travel card spending could grow to $310 billion if organizations expand the categories of travel-related goods and services purchased with the travel card and use the card more aggressively to pay for those goods and services. 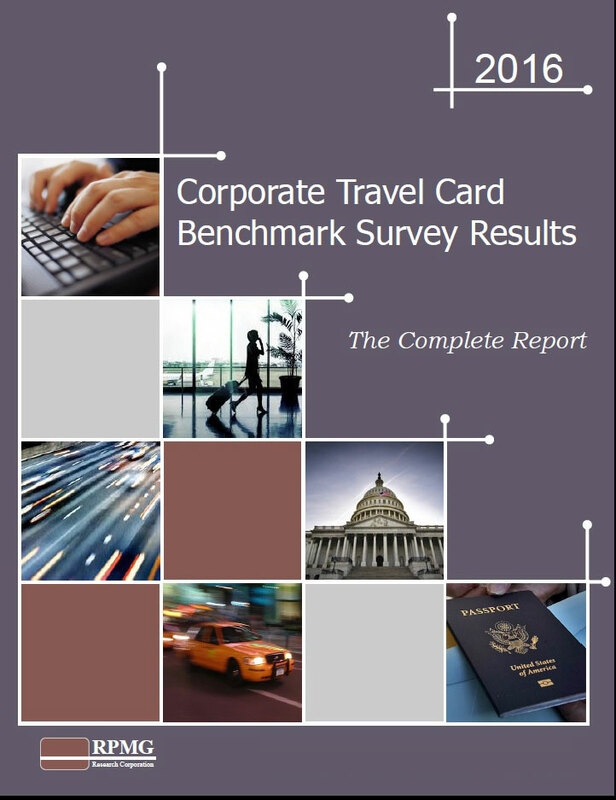 These findings are among many new insights into the progress of travel cards in the marketplace reported in the 2016 edition of the Corporate Travel Card Benchmark Survey Results (“Results”) recently released by RPMG Research Corporation. The information in the Results is based on over 1,300 responses from travel card-using organizations that were either customers of one of thirteen major financial institutions or members of the National Institute of Governmental Purchasing or the National Association of Purchasing Card Professionals. Seventy-three percent of Corporations and 62% of Government and Not-for-Profit entities expect travel card spending to increase through 2020. Growth expectations are strongest among small and medium-size corporations as well as all organizations that reported strong travel card spending in the past. In the public sector, School Districts and Colleges and Universities are most optimistic about travel card spending growth. Cities and counties, state agencies, and not-for-profit organizations expect lower growth over the next five years. The average respondent to the Survey distributes travel cards to 19% of employees and reports $1.7 million of monthly spending on travel card accounts. The typical card is associated with 4.77 monthly transactions at an average transaction amount of $195, or $929 per month per card. About 78% of all travel cards are “active” (i.e., used in a given month). Travel card spending is composed primarily of expenditures for air fare and ancillary fees (36%), lodging and accommodations (22%), restaurants (11%), and auto rentals (5%). A variety of trends related to travel card use and management are reported in the Survey Results along four major themes: Technology, governance and risk management, the choices associated with “best practice” travel card programs, and important “benchmark data” by size and type of organization. The survey response shows that use of mobile technology has increased significantly since 2013 and is expected to double within three years. The percentage of “open booking” of travel (where employees book travel as they see fit) has increased from 28% in 2013 to 35% in 2016, largely driven by increased open booking arrangements in Middle Market corporations and Government and Not-for-Profit organizations. The use of software that pre-populates expense reports with travel card data is up from 27% of respondents in 2007 to 45% in 2016. There are notable benefits to pre-populating expense reports with travel card data, including reduction in the “end-to-end” cost to process an expense report and a shorter expense report cycle time. Across the survey response, 69% of respondents indicate they use travel expense management software (EMS). Ten percent of respondents use one or more type of “electronic accounts payable” (EAP) for payment of travel expenses and report average monthly spending of $715,680 via the EAP platform, an amount over three times higher than in 2013. Sixty-six percent of respondents experienced increases in their travel budget over the past three years. The average travel budget as a percentage of revenue (or budget for Government and Not-for-Profit organizations) has risen from 1.02% in 2013 to 1.25% in 2016. The current “top-most” goals for travel card programs involve enhancing convenience for employees, obtaining rebates and other financial incentives from the card issuer, and establishing clear travel card policy guidelines. Thirty-two percent of respondents had made their travel policy more restrictive over the past three years. The changes have had no negative impact on travel card spending and may have actually contributed to increased spending activity. Policies to mandate travel card use have become increasingly common over the last decade and are used by the majority of corporations. The average monthly travel card spending limit has risen to $8,167 in 2016. The current set of defining features of control over the travel card program include mandates, clear disciplinary policy, employee training, audit review of key program controls, data mining of card expenditures, limitations on personal expenditures, travel booking restrictions, better integration of technology, and measurement of the performance of the travel expense management process. Overall, 94% of respondents believe travel cards pose a lower or similar risk of travel policy violations compared to other payment methods. Similarly, 86% of respondents believe that travel cards pose a lower or similar risk of fraudulent expenses as compared to other payment methods. The 2016 Results inform the reader of travel card practices by organizations that generate the greatest benefit from card use. The Results identify actionable “best practice” choices in areas associated with program goals, travel policy, activities to manage and leverage travel spending, card distribution and lines of credit, card use limitations, card spending control and compliance mechanisms, investments in technology, performance measurement, and the use of card data. Organizations with high performing (“best practice”) travel card programs report greater benefit from travel card use in a variety of ways, including enhanced employee convenience and safety, increased administrative efficiency (particularly when combined with electronic reporting and expense management software), reduced reimbursement cycle times, higher vendor discounts (driven by enhanced spend visibility), greater compliance with organizational travel policy, financial incentives, and the elimination of travel advances. The Results enable the reader to assess and find ways to improve their own travel card program performance by providing benchmark travel card program statistics by size of business, type of governmental unit, and industry category. Special sections of the Results explore other market trends, including the use of travel cards outside of the U.S. and Canada, the integration of “backend” expense management systems with travel booking software, greater insight into liability arrangements, the use of direct billing for travel, meeting/event and prepaid cards to address travel needs, and customer satisfaction with card economics, service and support, technology, data capture and integration, and reporting. A complete copy of the 2016 Results can be added to the cart by clicking the button on the right. Any further questions about the report may be directed to Professor Palmer at Richard.Palmer@RPMGresearch.net.